Color Brown to grey, less often red, blue, white, yellow. Corundum is a crystalline form of aluminum oxide and a rock-forming mineral. It is naturally clear but can have different colors when impurities are present. It is superior in hardness and therefore useful as an abrasive. In addition, transparent, colored specimens are valued as gems. These gemstones are called ruby, if red, or sapphires, for colors other than red. The word "corundum" comes from the Tamil kurundam. Corundum occurs as an accessory mineral in mica schist, gneiss, and some marbles in metamorphic terranes. It also occurs in low silica igneous syenite and nepheline syenite intrusives. Other occurrences are as masses adjacent to ultramafic intrusives, associated with lamprophyre dikes and as large crystals in pegmatites. Because of its hardness and resistance to weathering, it commonly occurs as a detrital mineral in stream and beach sands. Compared to most minerals, corundum is superior in hardness, rated as 9.0 Mohs. Its hardness is explained based on the structure of its crystals. The oxygen atoms are arranged in a hexagonal close-packing arrangement, with the smaller aluminum atoms occupying two-thirds of the octahedral gaps. In addition to its hardness, the density of corundum is unusually high for a transparent mineral composed of the low atomic mass elements aluminum and oxygen. Its density is 4.02 g/cm3. Given its high degree of hardness, corundum is commonly used as an abrasive, for applications ranging from huge machines to sandpaper. Some emery is a mix of corundum and other substances, and the mix is less abrasive, with an average Mohs hardness near 8.0. Also, as mentioned above, rubies and sapphires are different forms of corundum and they are valued as gemstones. Gem-quality synthetic corundum is usually produced by the flame-fusion method (also called the Verneuil process). This allows the production of large quantities of sapphires and rubies. It is also possible to grow gem-quality synthetic corundum by flux-growth and hydrothermal synthesis. Because of the simplicity of the methods involved in corundum synthesis, large quantities of these crystals became available on the market, significantly reducing the price in recent years. Apart from ornamental use, synthetic corundum (that is, sapphire) is also used to produce mechanical parts (tubes, rods, bearings, and other machined parts) and lasers. Emery is a very hard rock type used to make abrasive powder. It consists largely of corundum, mixed with other species such as the iron-bearing spinels hercynite and magnetite, and also rutile (titania). 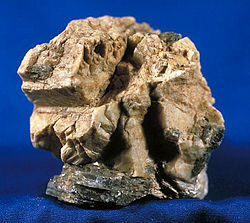 Industrial emery may contain a variety of other minerals and synthetic compounds such as magnesia, mullite, and silica. It is black or dark gray in color, less dense than translucent-brown corundum with a specific gravity of between 3.5 and 3.8. Because it can be a mix of minerals, no definite Mohs hardness can be assigned: the hardness of corundum is 9 and that of some spinel-group minerals is near 8, but the hardness of others such as magnetite is near 6. Crushed or naturally eroded emery (known as black sand) is used as an abrasive—for example, on an emery board, as a traction enhancer in asphalt and tarmac mixtures, or as used in mechanical engineering as Emery cloth. The Greek island of Naxos used to be the main source of this industrially important rock type. It has been mined on the eastern side of Naxos for well over two thousand years until recent times. However, demand for emery has decreased with the development of sintered carbide and oxide materials as abrasives. This page was last modified on 24 March 2017, at 19:57.